Like so many, on the night of Friday, June 29th at 9 pm, our world went dark. The power goes out here off and on, so we didn't think much about it. We were in the midst of a heatwave, so the next day quickly became uncomfortable in the house. I never realized how comforting it is to have a/c - I just took it for granted. Saturday evening when the power wasn't back on, we bought some ice to try to save the food in our fridges and freezers. On Sunday morning our power came back on, and we thought we were good to go. I spent the day cleaning out the fridge (we did lose a few things), doing dishes and baking bread and pretzels. But then very early Monday morning the power went back out. And this time, it didn't come back on. We have a well, so we don't have running water when the power is out. Luckily, we do have our white trash swimming pool up, and it's not green (yet) so we were able to cool off. We also have a gravity fed spring on our property, so although it isn't drinkable water, we can use it to fill buckets for the toilet. We can hook a hose up to it and take showers in the yard - they might be a bit chilly but it's better than a week without a shower! Monday Cort really struggled with his asthma. Technically he's supposed to be doing a nebulizer treatment 2x a day as a preventative. When you don't have power, you can't use a nebulizer. We went to a church shelter for the day to get him out of the heat, and he used his inhaler. He struggled some that night, but the next day seemed better. I worried about him though. Then I started getting migraines each afternoon - a combination of stress and heat. I hadn't had migraines in years, and didn't have medications on hand for them. Normally, I'd go into a dark cool room to sleep it off. But instead, I lay in the sweltering heat of the day, with no escape from the pain in my head and a high sensitivity to light and noise. If you've ever had a migraine, I'm sure you can imagine how I was feeling at this point. 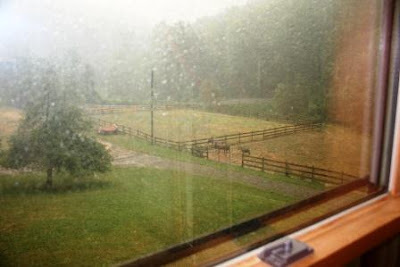 In the evenings, crazy storms continued to roll through, washing out our driveway (see to the right of the apple tree). We welcomed the brief cool down and breeze that the storms would bring. Although the new leak that sprung from one of our sliding glass doors was not so welcome. Piles of laundry mounted in our house. Meals were a challenge - we could cook on the grill, but didn't want to open the fridge to get out food. My uncle brought up their generator and was kind enough to set it up for us, so we wouldn't lose any more food. We were thankful to have a way to charge cell phones and laptops. I went to the doctor, in desperation for escape from the migraines. I broke down crying on the exam table, causing great alarm in my 3 boys who then proceeded to make rounds telling me how much they loved me, and how beautiful I was, for the remainder of the exam. The doctor noticed Cort's asthma, and suggested that if it got worse again we make sure to get him someplace with air conditioning until power returned. I was thankful for some medication to treat the relentless headaches. The week definitely dragged on. Friday came around again and still we were without power. And while I realized that other people lived in much worse situations, my spirits were discouraged by this point. Kind people offered us places to stay, but I've always felt tied to home, and was reluctant to pack up and leave. Furthermore, the news was full of reports of people who had their homes vandalized and robbed after they'd left to find a place with power. We headed to my parents' house to do laundry, cool down, and give Cort a nebulizer treatment. When we came home, the power was on! The next few days I spent playing catch up with the cleaning and cooking, but I was so happy to be functioning at a normal level again! Paul came home from work that Friday night and said, "Do you want to camp out tonight?" So not funny. It's Rural Thursday! Link up your stories of the rural life by grabbing the code beneath the button and pasting it into your blog post. Then come back and link up your actual blog post. Please be sure to visit and comment on at least 5 other participants. Thanks for joining in! Lisa, that is so sad..I am glad you had the help you did. I have had migraines, and that is not fun, let along a child without his treatment. That is pretty rural, but sounds better than being urban in a power outage. Your sweetie, I'm glad you now all have normal. Ouch! I'm glad the situation has improved for you but have to admit to being very worried. Having grown up in the back of beyond I remember going long periods without power but can't imagine doing it with 3 little ones, let alone one with asthma. I salute your perseverance! On the other hand, awww at your boys and their loving and supportive statements; you've obviously done a great job with them! You handled it much better than I would have! I can't even imagine with the migraine and the asthma. You are incredible. I'm glad you have power back up and running. Wow, that's awful! Losing power is one thing, but dealing with a migraine and a child's asthma is enough to push anyone to the edge. Not to mention during an oppressive heat wave. We lost power over the weekend, but it was nothing like your experience. We never know how much we depend on electric until it goes off. So happy your power is back on. When things like this happen, we realize how much we depend on all the comfortable recourses we have around us. Glad to hear the power is back on. I am so glad it has come back on! What a rough week! I hadn't thought about his allergies! What sweet boys you have to be so concerned about their Mommy! Glad you finally have the power back on. Years ago, we had a terrible ice storm come through our area at Christmas. Power was out for 8 days. I think the cold was much easier to deal with than heat would have been! My admiration and respect for you has really gone off the charts. Bless your heart for all you went through. Just the heat would have done me in. I can't imagine doing it all with migraines and Cort's asthma. I have to admit you were in my thoughts those days where I knew you were without power and having to deal with all of the off-grid stuff. Makes you appreciate electricity that much more! You did it though -- perhaps a generator is on the shopping list? oh, honey, i'm sure that was miserable, and very worrisome. so glad you made it through without anything worse! Wow! That does sound pretty crazy. 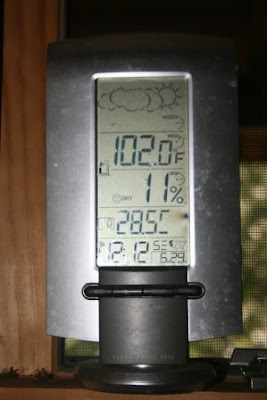 We typically don't lose power in the summer, and even if we did, it just doesn't get hot enough up here for it to matter. But, the winters, well we can lose power a lot then. And although our food won't go bad because we can move it to coolers outside, we don't have a wood stove, so staying warm is something we think about a lot. I'm glad that you got your power back though! And I hope your headaches have subsided and the asthma has calmed down. I am so sorry you had to go without power for so long! That must have been awful, especially with Cort's asthma and your migraines. I can understand how stressful all of that must have been. So glad the power is on. We were so grateful that we had power, but I sure did wish I could share it with others, including with you! 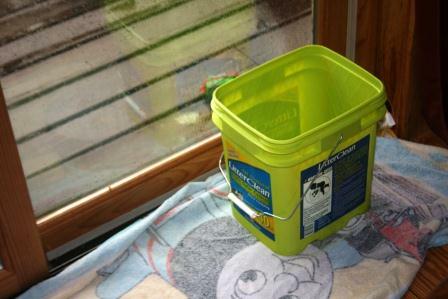 My husband is looking at generators--we don't have one, and he wants to be prepared. Our power was out for two days. I can't imagine how awful it was to go for so long without power, and with the weather complicating medical problems. I;m glad to hear everything's getting back to normal. Gosh, I didn't realize what a challenge it's been for you lately. So glad that you are powered back up so that life can return to normal. Isn't it sweet how children will try to comfort a discouraged parent? You are blessed. I'm so glad that's over for you! I hope you get power back soon!!!! I feel for your whole family! A few years ago we had our air conditioner stop working. My husband was watching our 2 and our 2 nephews. 4 kids and no air isn't fun. I have a history of asthma and allergies. Part of why I had to move from Georgia was from me getting migraines. It feels a bit like a walking hang over. HUGS!!! I hope everything just gets better, certainly not worse! Losing electricity doesn't seem so terrible until it happens. I'm so sorry about your tough week - that's such a long time is so much heat. Enjoy your ac now that it's back! oh I am so sorry that you had to go so many days without electricity, but so glad that it is back on again. So many things that we take for granted till they are not there! Hope that all of you are back to normal. Oh Lisa, those beautiful boys of yours! I'm so touched! I'm glad your power finally came back on, and I'm so sorry it was such a big inconvenience while it was out:) I for one will be glad when this heat wave ends out here. It's making all of us grouchy! I owe you a nice long convo-it's coming soon, my dear:) Hugs! I am so thankful you were able to get some relief for you headache and find a place to help his asthma too. It is so hard to be without power for an extended period of time. We were without power for 13 days last year after a tornado hit us. Like you said, you don't realize how blessed you are until that is gone. So thankful it has been restored and you are catching up now. I would have gone crazy. That is a long time without power and yes I know things could be worse but when your living in it it is a different story. I bought myself a small travel nebulizer a few years back. You can get a battery back up for it which I didn't get but it came with a plug for the car. You may want to look into on. It was not expensive at all. You have been through a lot. I can imagine the worry you felt for your son. Husbands have a sick sense of humor sometimes. Wow, this sounds like a nightmare. We had minimal inconveniences due to the fires, but nothing like this. Makes you appreciate "technology" even more when it is back, eh? That sounds miserable! :( Can we help at all? For the migraines, make sure you're drinking enough water and eating enough food, as that can trigger them as well. Ice baths sound like a good idea after all that! Oh Lisa! I KNOW it must have been bad...we lose our power a lot & both kids and I have asthma. What a nightmare for you all. It touched me to read how the boys were there to soothe you in the doctors office. That is so sweet that they saw mommy upset and crying and wanted to help you. So glad that ordeal is over for you. :( What a mess. I'm so glad it's over! I can remember the crazy blackout many years back that took out much of the east coast. We slept on our couches with the windows open in our apt in Queens and were melting. I can't imagine it w/the kids and everything. For so long! Yikes! the heat is hard on little ones with asthma. I am sure your were so thankful to get your power back.The longest we had ever been with out power was four days. I can understand where your headaches came from. It's such a challenge to live without electricity because it is so engrained in our lives. I think it's almost worse to be without it in the summer rather than the winter. Glad you are back on the grid! Oh I can imagine how stressful it was for all of you! A migraine and Cort's asthma issues, no elect- the weather being hot-- too much going on. We have a spring too and we know what it is like to have no electricity. Holy crap, Lisa. I didn't know there was even more going on beyond the power outage. I'm so glad things have returned to normal over there. Holy crap. I can't say whether I know if little girls would react the same when you cry but I was touched by the image of your three sweet boys taking turns in telling you how beautiful you are and how much they love you. I am blessed to have two similar types over here that run to me if they see me crying, tell me how much they love my pretty shirt:) What a rough few days - I honestly don't think I would have fared as well. Oh my gosh, Lisa...I can really relate to your migraine pain. I get them too, and they are awful. So glad you have power now, but what a long week that must have been. So sorry for your tough week- especially with the migraines..that sounds just awful! Glad the electric is back on and life can go back to normal now!! Stopping by to say Hi from the blog hop. Come visit sometime, tea is cold and no shoes are required. Kathy B. http://www.southernmadeintheshade.blogspot.com Glad you electricity has stayed back on. my daughter has asthma so I know of your little ones struggles. I'm so sorry that all of that happened Lisa! I can't imagine how miserable you were trying to entertain 3 little boys in the extreme heat we had without electric. So glad your electric is back on! There are still people in West Virginia without electric today! We had a situation like this happen when I was in high school. Only it was the dead of winter and we lost power in a blizzard. We were four days without power with 14 inches of snow. The worst show on record in out area. We did not have to worry about food spoiling but we only had one small kerosene heater and the propane cookstove for warmth. There were ten of us in the family at the time and we settled into one small bedroom and the kitchen for the duration. We hung quilts to block the kitchen doorways to keep in the heat and made pallets on the floor of the bedroom for sleeping. We had no fireplace. We build a large bonfire outdoors and used the lard rendering and apple butter kettles to melt snow to keep the livestock watered. We drew water from the cistern for household use. Actually, most of the middle age children had a great time making snowmen, ice skating on the pond and sledding down a neighbors hillside. Us older ones not so much. I was assigned the task of keeping the little ones corralled and warm in that small bedroom since my parents had their hands full keeping both children and livestock cared for between the low temps, and snow drifts deep enough to loose a person or animal. Thinking about it we probably had the easier time of it then everyone in your area. I believe it is easier to bundle up and stay warm then cool down without power. But I personally would prefer the heat to the cold and the freedom of movement to being confined. I have certainly been grateful that I have never had to repeat such an experience and the memory of it has had me concerned about and praying for all the thousands in your situation over the past weeks. That sounds awful! I'm so glad it's back on. I hope you both are feeling better!